We serve commercial and residential customers in Nampa, Boise, Meridian and surrounding areas. Why settle for boring gray concrete for your home or business? We offer a range of concrete services to achieve an economical yet custom look for your garage, basement, patio, or business. From epoxy floor coatings to stamped concrete solutions, we serve Nampa, ID homeowners and business owners with reliable concrete services. Contact us to learn more about our epoxy flooring services & request an estimate. An epoxy floor coating is a protective and attractive coating that can be applied to new or old concrete surfaces. Our concrete epoxy doesn’t just protect your concrete from stains, moisture, and damage; it also looks great doing it. We offer a full array of high-grade epoxy concrete floor solutions for all types of applications. 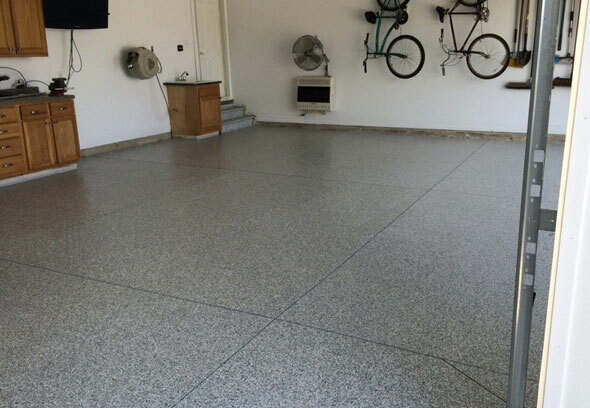 Homeowners often turn to epoxy coating systems to create a durable and high-performance garage floor epoxy surface. Our epoxy garage floor coating in Nampa, ID can resist vehicle traffic, dropped tools, moisture, oil, and gas with ease. The seamless concrete epoxy installation stops concrete dusting for good and creates a low-maintenance system that’s easy to sweep and mop. An epoxy basement floor in Nampa, Idaho is another popular solution. Rather than installing a traditional floor covering over your concrete, an epoxy coating helps waterproof your basement while delivering a completely seamless, slip-resistant, and attractive surface. Epoxy coatings can be as decorative as you want. A metallic epoxy floor can create a unique look in your basement or you may opt for a solid color, fleck epoxy, or a pattern of your choice. 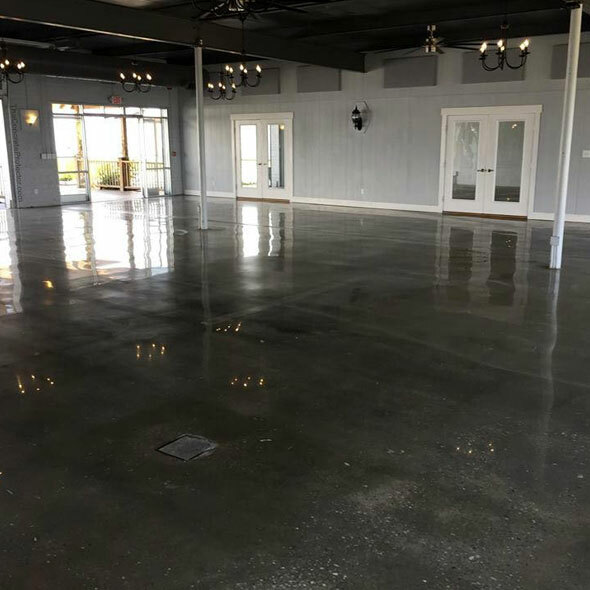 As one of the leading concreting polishing companies in Nampa, Idaho, we offer reliable and economical concrete grinding and polishing to take your existing concrete floors to the next level. A polished concrete floor increases the durability and longevity of your concrete floor by sealing the pores in the concrete and densifying the surface. Polished concrete is a common solution for industrial and commercial flooring but it can also be a stunning choice for residential spaces, including basements and garages. Don’t be fooled into thinking a polished concrete floor needs to be cold and industrial. Because we use a multi-stage process to polish concrete, we can incorporate stains and varying levels of finishes to achieve just the look you’re going for. We can even incorporate graphics and floor logos into our custom polished concrete solutions or create a beautiful polished floor that looks like stunning stained wood. A stained polished concrete floor comes with numerous benefits for residential and commercial clients. Our residential polished concrete floors resist stains, moisture, cracks, and other forms of damage. A polished concrete basement floor can expand your living space with a low-maintenance flooring solution that’s easy to clean. A polished concrete garage floor can also improve your home’s value and give you an ideal flooring solution for working on your car or hobbies. Because polished concrete uses the existing slab on grade without adding a new flooring material, it’s a cost-effective solution for businesses and homeowners. Our polishing process seals and densifies the surface of your concrete to create a hardworking surface that repels liquids and chemicals while resisting wear. Love the look of a wood patio or hardwood floors but don’t want to spend time on daily maintenance, splinters, rot, and termites? We also install wood stamped concrete in Nampa, Idaho for commercial customers. 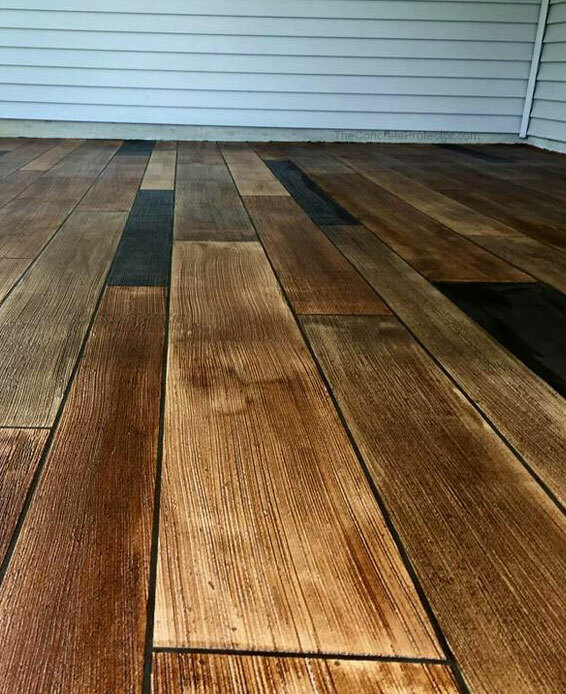 Wood stamped concrete is a beautiful and economical solution to transform new or existing concrete slabs into durable surfaces that look just like wood planks. Concrete that looks like wood lasts as long as regular slab concrete and resists weather, wear, and damage. We install concrete wood floors in Nampa, Idaho for residential and commercial clients with a range of customization options. The stamped concrete wood look is great for adding texture, pattern, and luxury to pavements at shopping centers, malls, hospitals, and more. To create concrete floors that look like wood, we pour concrete and stamp it with specially made wood plank stamps before it sets fully. This imprints the concrete with the pattern and texture of realistic wood grain. Stains are also used to get natural color variations that mimic natural wood. If you have existing concrete that you would like to update, we can also apply a stamped overlay. If the concrete is in good condition, stamped concrete that looks like wood will be applied over the existing slab for a brand-new look.